When you read about Isla Holbox and look at photos of it you expect to find a real gem of paradise. But is it really a paradise? 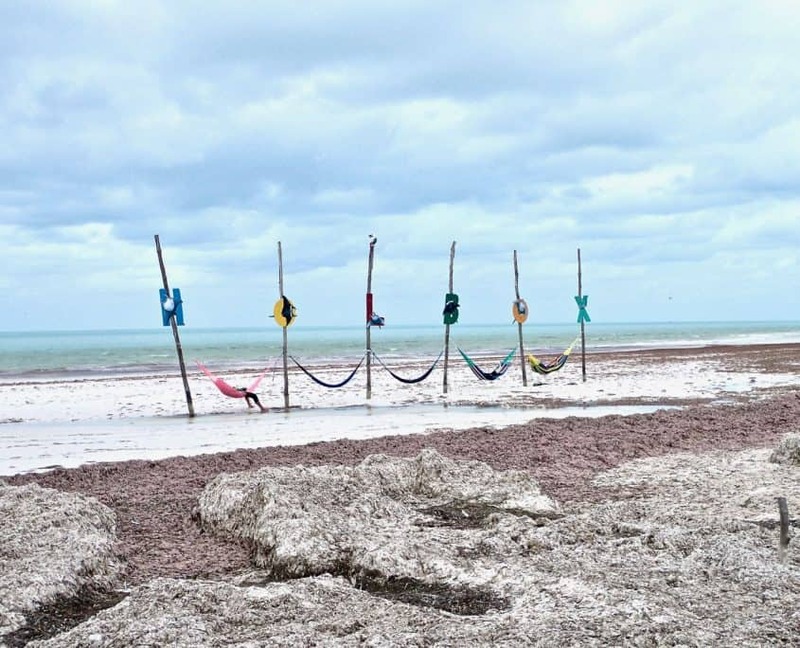 When we went there on our bicycle touring trip I got to see some other sides of Holbox that are not mentioned in most travel guides. No one wants to mention biting mosquitos, stinking seagrass that covers the beaches and especially not the environmental and social impacts of too much unhealthy tourism. 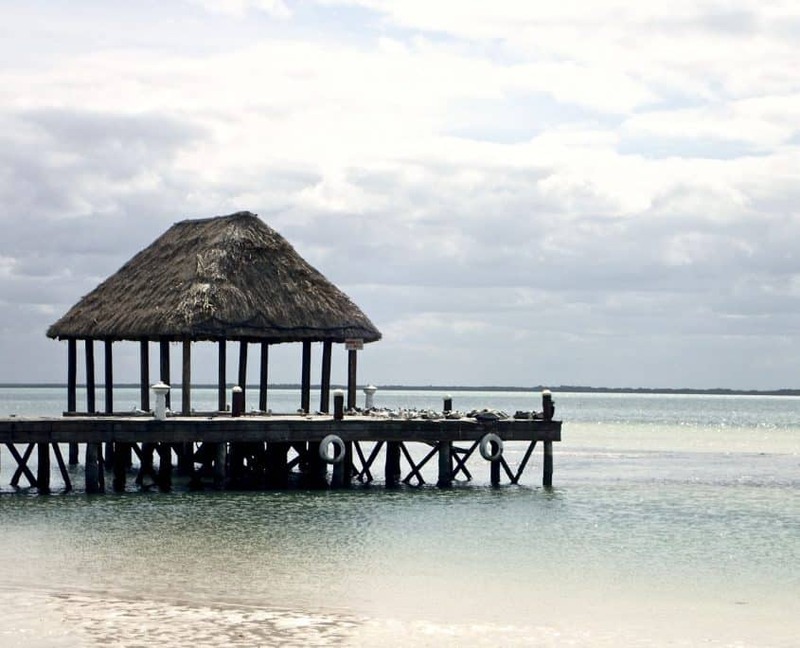 Isla Holbox (pronounced Hol-bosh) is a very small island northwest of Cancún. The island is about 42 km long and 2 km wide. 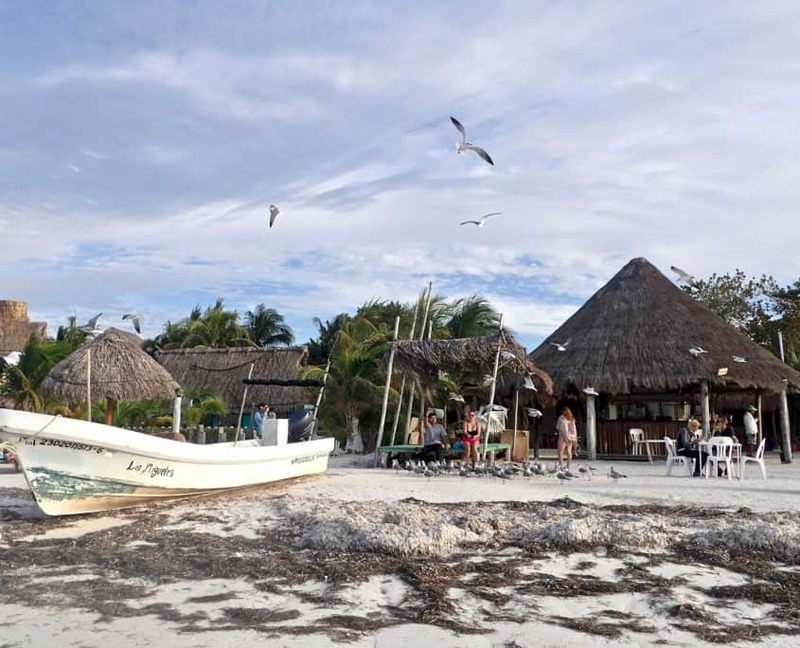 Separated from the yucatán peninsula by shallow waters the whole area around the Isla Holbox is home to many birds like pelicans and flamingos. Is Isla Holbox worth a visit? What do you really have to expect and what should you know before you go? I cycled with my partner Brad to a small village called Chiquilá at the coast of the Yucatán peninsula. From there we wanted take the ferry to Holbox island. There are two ferry options to choose from. 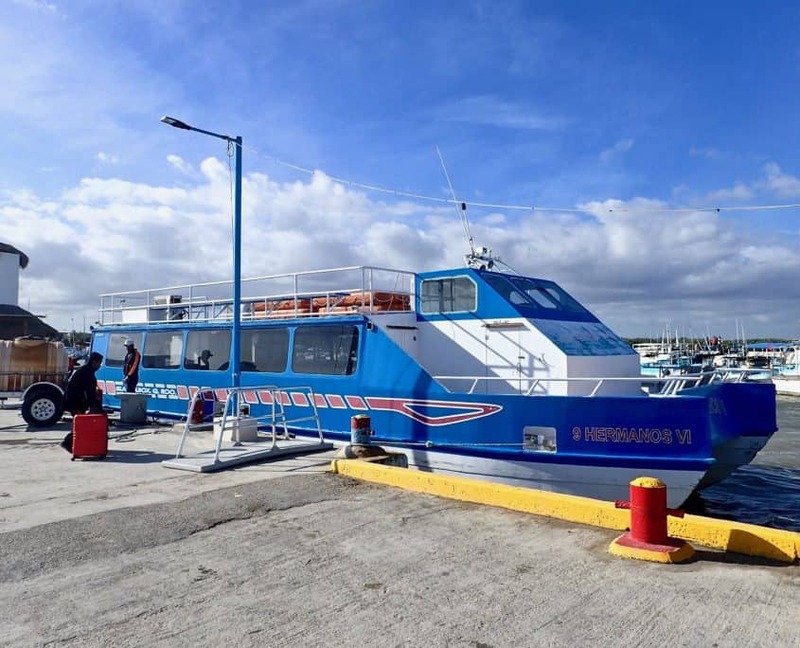 The more expensive express version that will take you to the island in about 15 minutes or the local version that takes about 30 minutes. We took the much cheaper and local version “9 Hermanos”. We paid MXN$ 140 each plus MXN$ 40 for each bike. That is the one-way fare. Ferries leave every 30 minutes during the day. So you can just show up whenever you like and get to the island. If you have to wait a bit for the ferry you can watch the seagulls and pelicans gliding in the wind! 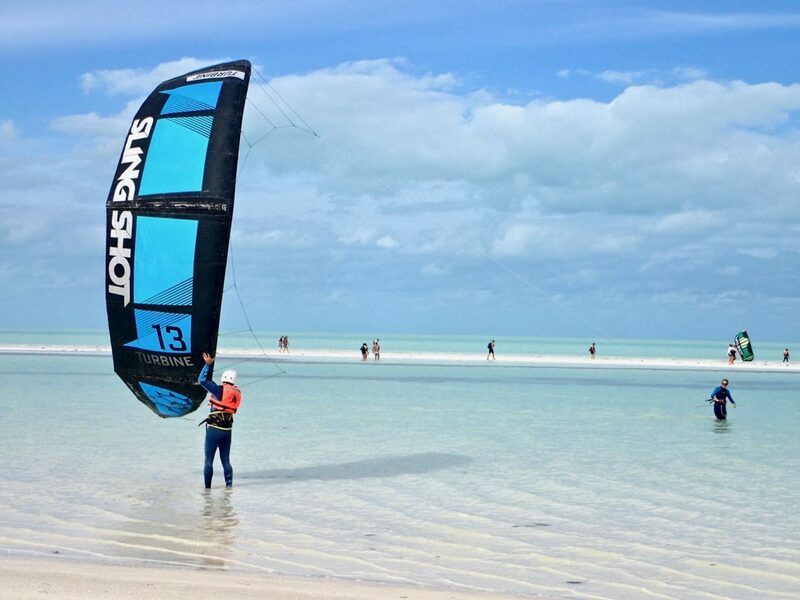 We visited Holbox in January but if I had a choice and could do it again I would go between Mai and September. At that time it is whale shark season in Holbox and you will have good chances to see the biggest fish on the planet! We stayed on the island for three nights and the weather was mixed. 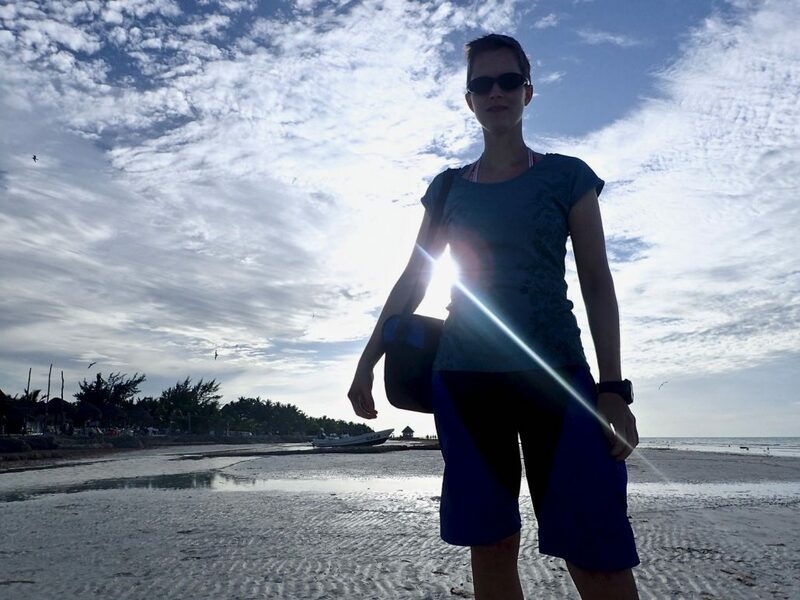 The weather didn’t provide at all the amount of sunshine you get to see on most of the photos of Isla Holbox! Walking along the beach in front of the big luxury hotels a strange, rotten smell came into my nose. Brad smelled the same. A quick look around and we could see the reason literally everywhere: huge amounts of rotting seagrass covered the beaches right in front of the hotels. I don’t know if this was just bad timing or if it is normal to have all that seagrass at this time of the year. 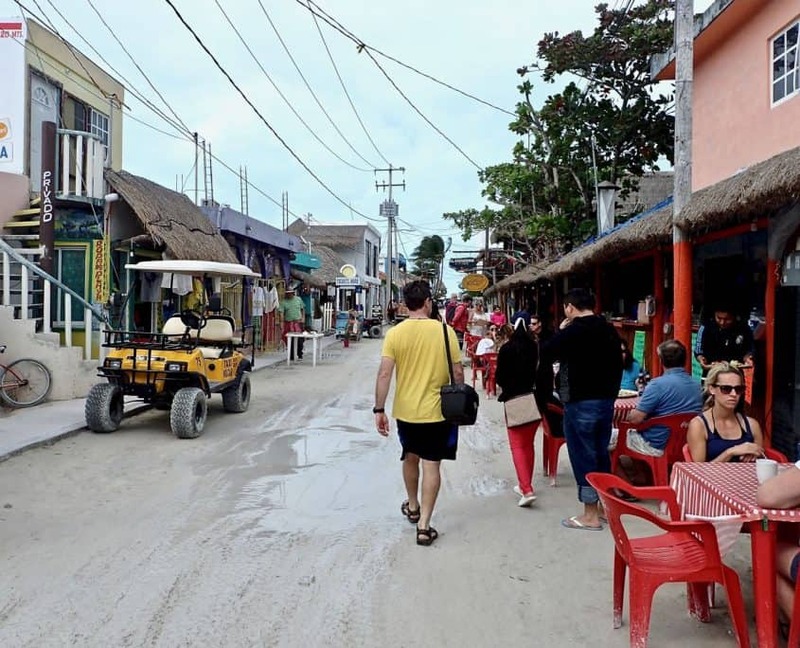 There are nearly no cars on Isla Holbox. That is really a great achievement! Tourists and also the locals mainly use golf caddies or mopeds to get around. You can rent a golf caddy in many places. All streets are sandy and I guess it gets very muddy when it’s raining. We could see some waterholes as wide as the streets! Our method of traveling around Isla Holbox were our bicycles. As distances were not too big, we could easily go for a ride and reach the edge of the island at Punta Cocos. Isla Holbox offers all kinds of places to stay from very luxury hotels with private jacuzzi to budget hostels. Unfortunately the increasing amount of tourists leads to higher prices for accommodation and food. We stayed at Hostel Ida Y Vuelta. This place offers private bungalows as well as camping. Of course we pitched our camp in the backyard of a very nice garden. The hostel and its garden are very nice, well-maintained and the bathrooms are clean. 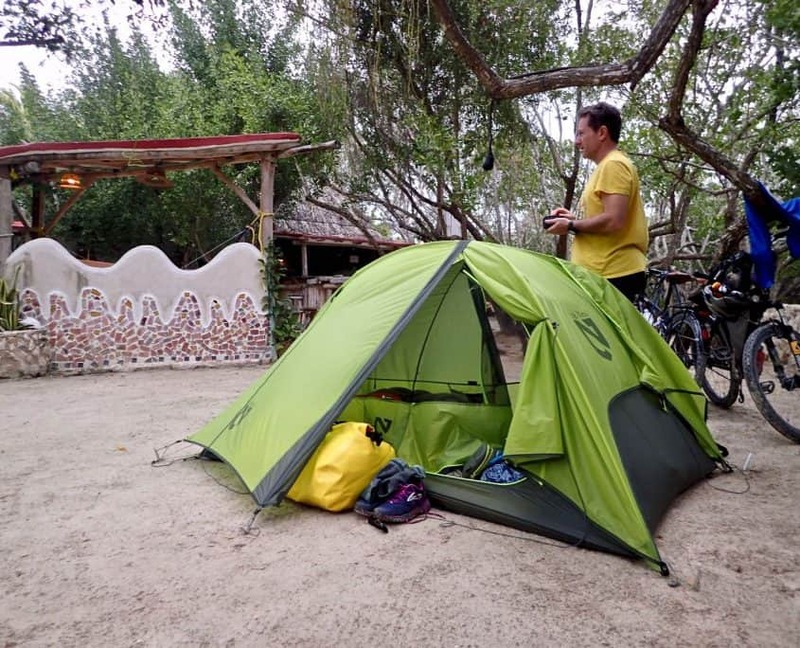 For MXN$ 150 each the camping option also included a small breakfast. On our second day, the reality of camping cought us, when a noisy group of young Mexicans pitched their tent directly next to ours. But by using earplugs we could get rid of most of the noise and finally find some sleep. The major downside were the mangroves behind the hostel area. We had to fight against mosquitos every night. Looking out of the tent on our last morning, I could see small little flies everywhere on the inside of our tentfly. It turned out they were nasty sandflies and as soon as we left the tent they started to feast on us. 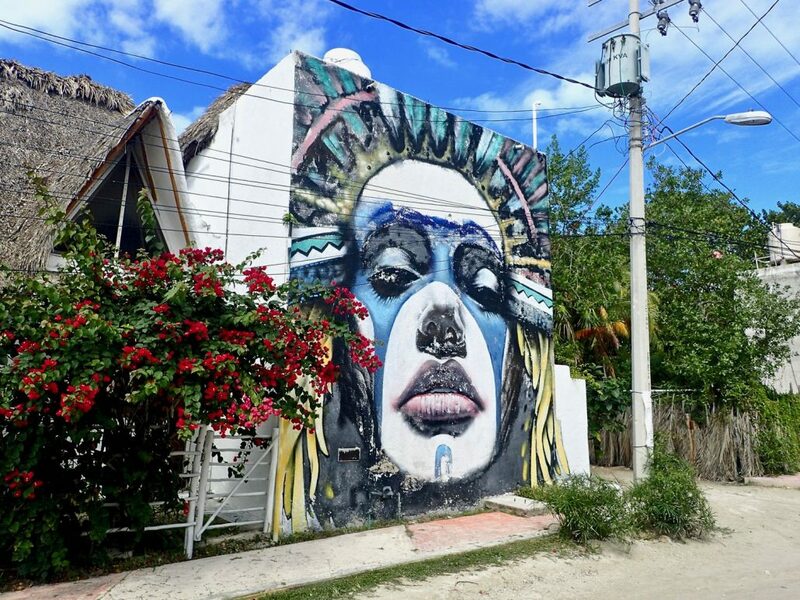 When you walk around the little village of Holbox you will mostly see other tourists, touristy shops and touristy restaurants. The days are long ago when this place was a nice little fishing village with a unique tradition – as it is mentioned in some travel guides. But it is still possible to get away from the crowds and find some tranquility. 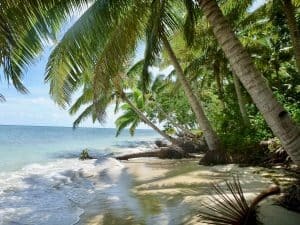 One day we cycled to Punta Cocos and on another day we hiked along the beach towards Punta Mosquito. On our way to Isla Holbox western edge, known as Punta Cocos, we cycled on small roads out of the main village. Once beyond Holbox very small airport we met less people. It seems that only a few cyclist or tourists in a golf caddy make all the way to Punta Cocos. 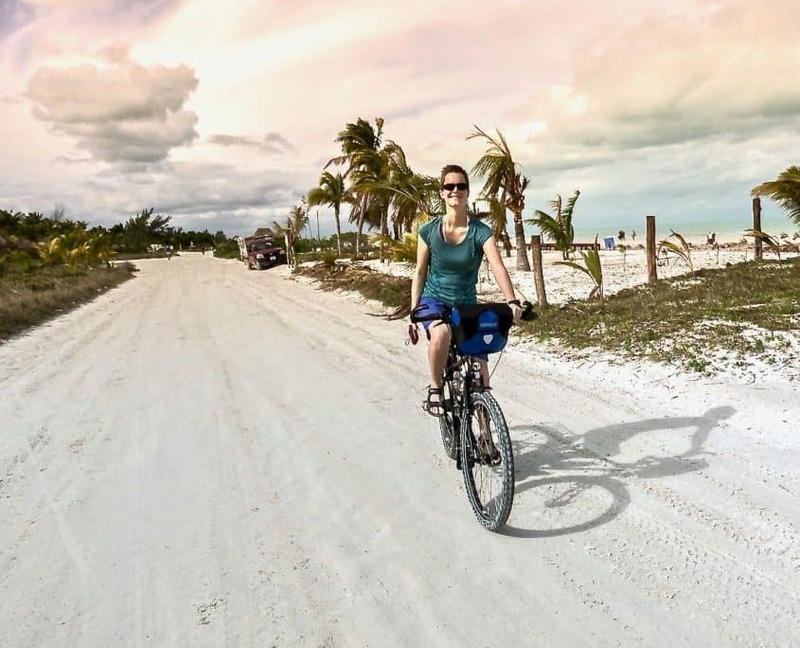 While cycling we could witness the still blooming success of Holbox growing tourist industry. Mexican workers buildt one new hotel next to the other. Finally we arrived at Punta Cocos and cycled for a while along the beach. 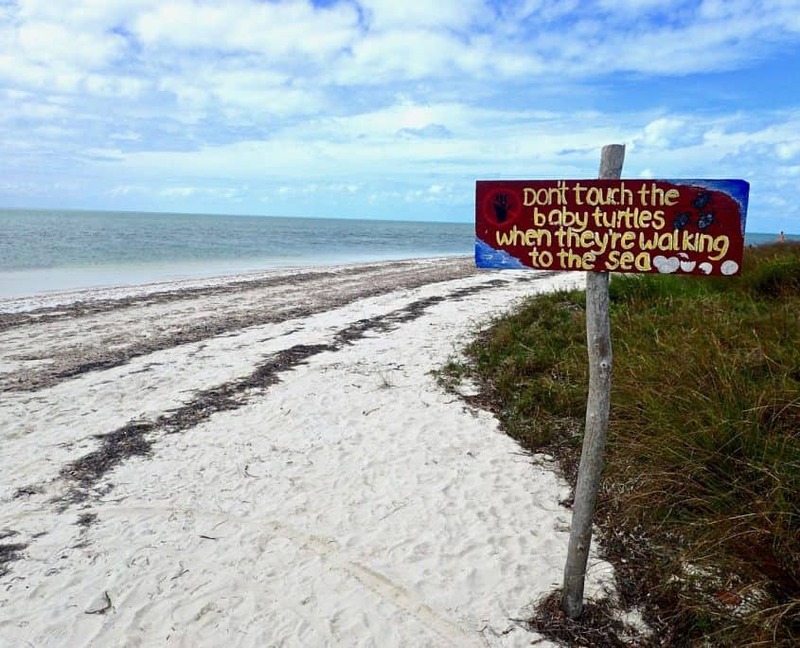 It was less crowded and a sign told us of another attraction Isla Holbox had to offer at another time of year: turtles breeding on the beach! A couple of photos later we left Punta Cocos and cycled back for lunch. Our food of choice were some tacos at a small streetfood place at the edge of the village that was run by locals. One streetfood taco is normally around MXN$ 10 (0,50 €) and two of them make a nice meal. 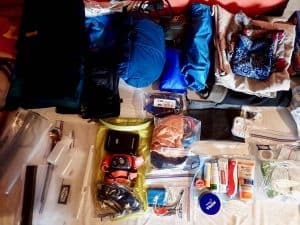 Great food for the budget traveler! The next day we started early to hike along the beach in eastern direction towards Punta Mosquito. When it’s low tide a sandbank appears out of the ocean and you can walk on it for more than 5 kilometers. Of course the tide was still a little bit high when we got to the place to cross over. With mixed feelings I set my foot into the water. Luckily I was wearing sandals that I could also wear in the water. I followed Brad and we crossed about 200 meters of knee deep water to reach the sandbank. The water was clear to the ground and so I could avoid stepping into slushy seagrass for most of the time. Once at the sandbank it was amazing to walk along. The reward of getting up early and hiking through the water was that we were all alone! Well, not totally… There were lots of seagulls, pelicans and igrets we could watch close by. 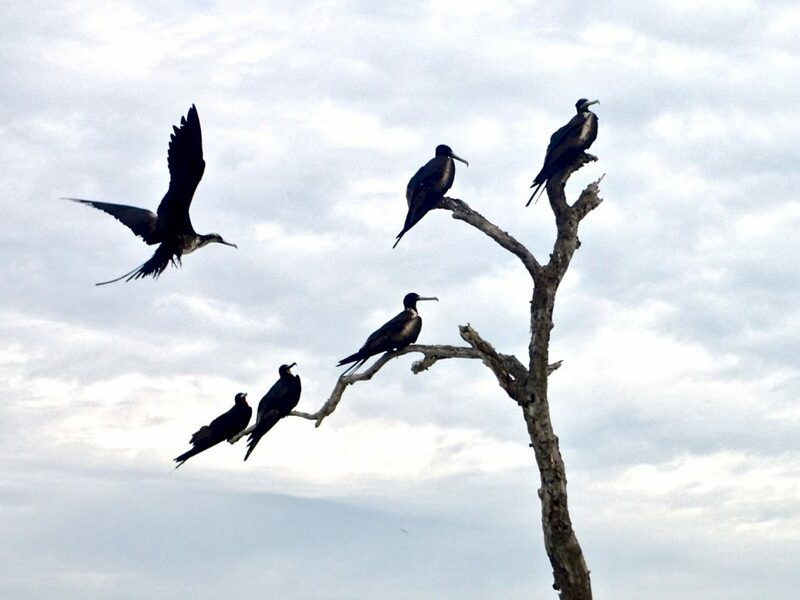 Actually lying withing the natural reserve of Yum Balam, Isla Holbox seems to be a great place for birdwatching! We hiked on until we reached the estuary of a river in the middle of mangroves. The water was too deep here to keep hiking as we had some electronics in our backpacks and couldn’t swim. It was very nice to walk along the sandbank and see all the birds! On our way back we bumped into lots of other tourists wandering the same way as the tide was very low. Lucky us, we had been so early! One evening we went to the beach to watch the sunset. 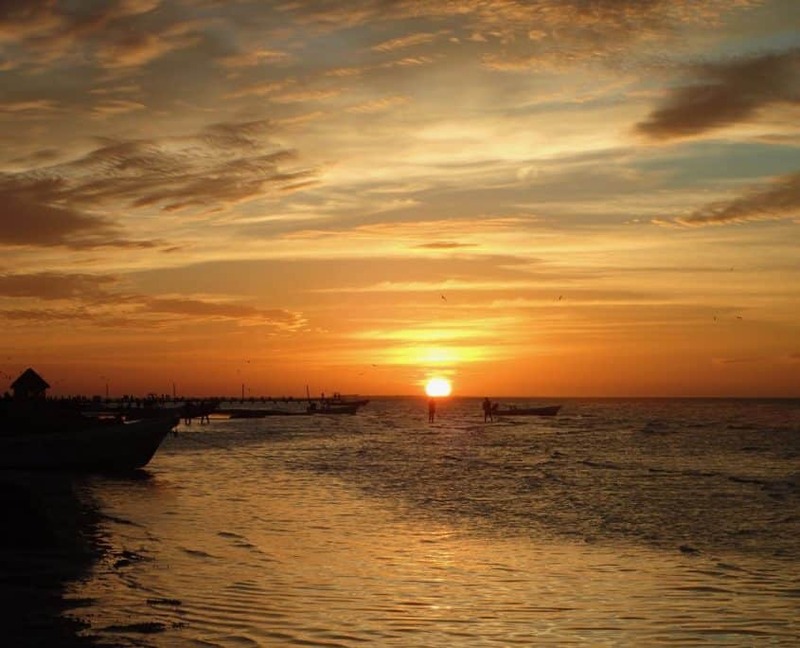 I didn’t know before, that Holbox is also known for great sunsets but now I know why. Just have a look at the photo. Isn’t it amazing?! 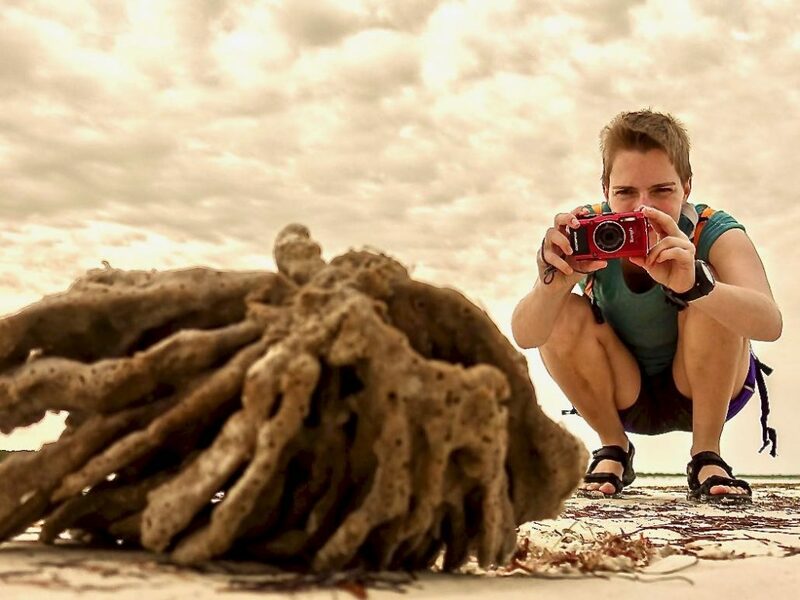 Should I travel to Holbox? It depends on your personal preferences. Isla Holbox is still a place that offers some awesome nature. If you are into birdwatching it is definitely a great place to see! If you go there please be aware of the vulnerability of the ecosystem. Something the Mexicans haven’t realized yet. Maybe in a few years when mass tourism destroyed the most beautiful spots in their country, they will start regulating. For me personally it was sad to see how tourism slowly destroys what once was a Mexican-caribbean paradise. 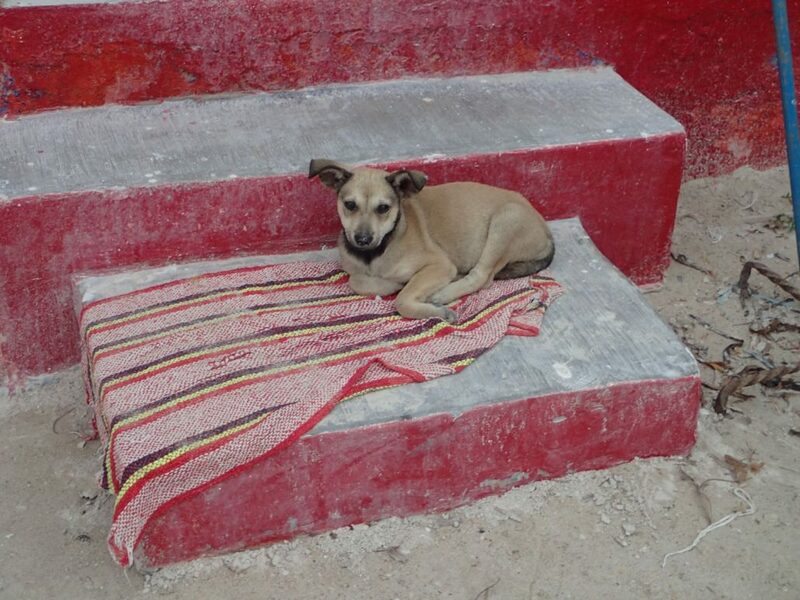 I leave Isla Holbox with mixed feelings. We went there as well because of the promotion of the island on the internet. Not many people want to read a travel guide that is critical and doesn’t promise exactly what they want to see. It is sometimes hard and challenging to paint a picture close to reality but I always try. If you travel to Isla Holbox you might not find what all the nice photos and travel guides promise. You will find a culture and tradition of the locals that is nearly not existing anymore in favor to cater for mass tourism. You will find some wonderful nature and an ecosystem that is at its limits of taking. If you go and visit Isla Holbox, be a responsible tourist, because that is what the island needs!